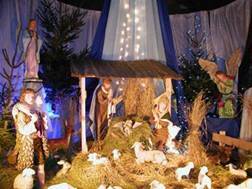 The season of Christmas celebrates the birth of Christ and the beginning of his mission culminating in his baptism. Christmas confirms for us that “God so loved the world that when the fullness of time had come he sent his only begotten son… not to condemn the world but so that all might be saved” John 3:16,17. In our Parish, we gather, with joy, as a community celebrating God’s faithfulness to his people. We exchange Christmas greetings with our Christian neighbours. The children re-enact the events of the Nativity at the family Mass. We live this time with sensitivity to our fellow man.